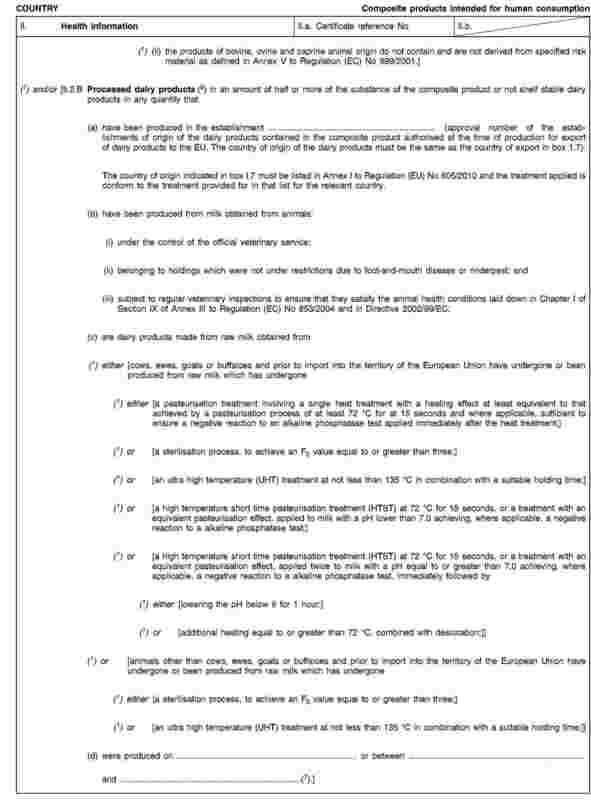 Directive 97/78/EC provides that veterinary checks on products from third countries introduced into the Union are to be carried out by Member States in accordance with that Directive and with Regulation (EC) No 882/2004. Regulation (EC) No 882/2004 lays down general rules for the performance of official controls to verify compliance with rules aiming, in particular, at preventing, eliminating or reducing to acceptable levels risks to humans and animals, either directly or through the environment. Directive 2002/99/EC lays down the general animal health rules governing all stages of the production, processing and distribution within the Union and the introduction from third countries of products of animal origin and products obtained intended for human consumption. Regulation (EC) No 853/2004 lays down specific rules on the hygiene of food of animal origin for food business operators. Article 6(4) of that Regulation provides that food business operators importing food containing both products of plant origin and processed products of animal origin (composite products) are to ensure that the processed products of animal origin contained in such food satisfy certain public health requirements laid down therein. In addition, Regulation (EC) No 853/2004 provides that food business operators must be able to demonstrate that they have done so, for example through appropriate documentation or certification. Regulation (EC) No 853/2004 applies from 1 January 2006. However, the application of a number of measures laid down therein with immediate effect from that date would have presented practical difficulties in certain cases. 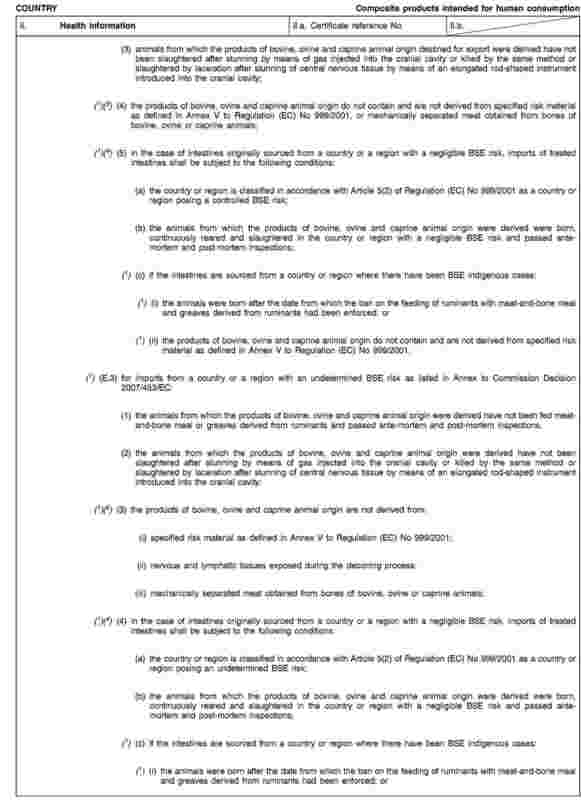 Commission Regulation (EC) No 2076/2005 (6) therefore provided that, by way of derogation from Article 6(4) of Regulation (EC) No 853/2004, food business operators importing food containing composite products were to be exempt from the obligation provided for in that Article. Commission Regulation (EC) No 1162/2009 of 30 November 2009 laying down transitional measures for the implementation of Regulations (EC) No 853/2004, (EC) No 854/2004 and (EC) No 882/2004 of the European Parliament and of the Council (7) repealed and replaced Regulation (EC) No 2076/2005. 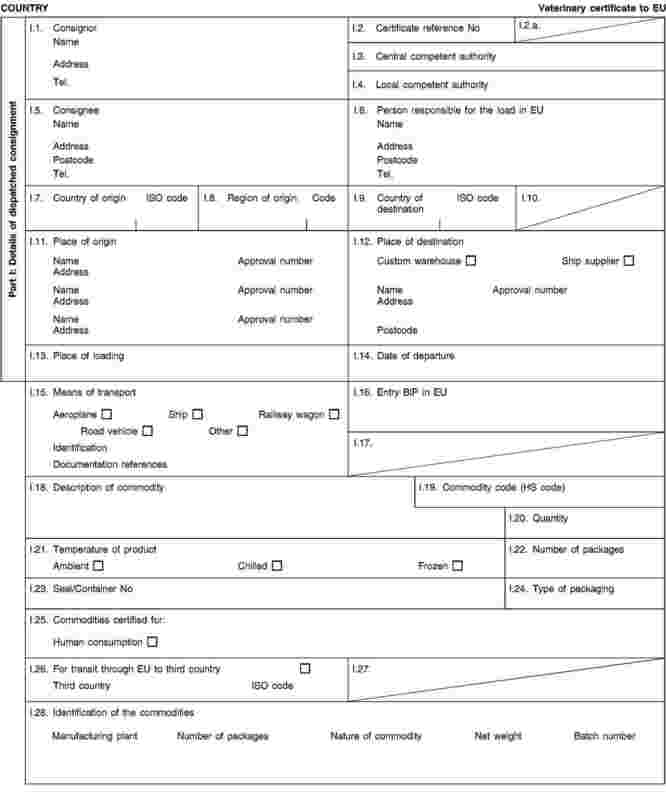 Regulation (EC) No 1162/2009 contains the same derogation from Article 6(4) of Regulation (EC) No 853/2004 as did Regulation (EC) No 2076/2005. In addition, Regulation (EC) No 1162/2009 provides that imports of composite products are to comply with the harmonised Union rules, where applicable, and with the national rules implemented by the Member States in other cases. Regulation (EC) No 1162/2009 applies until 31 December 2013. 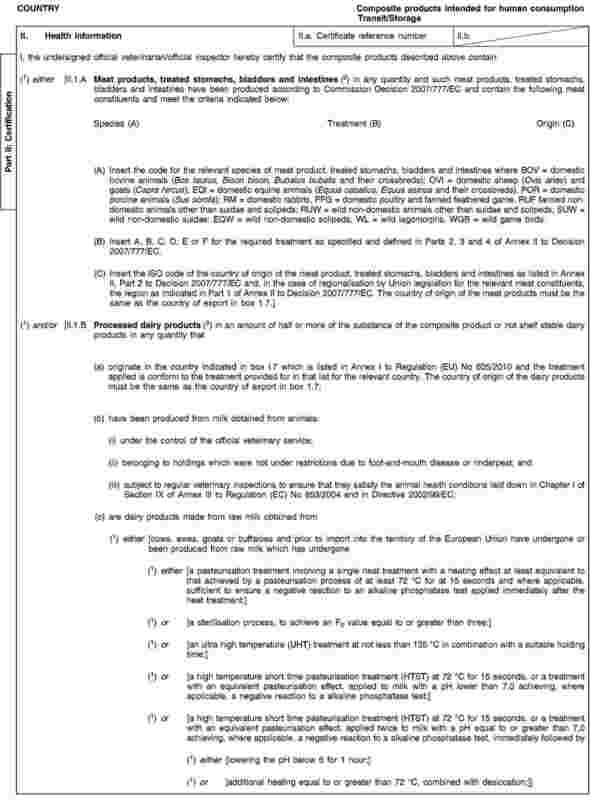 Commission Decision 2007/275/EC of 17 April 2007 concerning lists of animals and products to be subject to controls at border inspection posts under Council Directives 91/496/EEC and 97/78/EC (8) provides that certain composite products are to be subject to veterinary checks, when imported into the Union. Pursuant to that Decision, the composite products subjected to veterinary checks are all those containing processed meat products, those containing half or more of their substance of any one processed product of animal origin other than processed meat products and those containing no processed meat products and less than half of their substance of processed milk product where the final products do not meet certain requirements laid down in Decision 2007/275/EC. In addition, Decision 2007/275/EC lays down certain certification requirements regarding the composite products subject to veterinary checks. It provides that composite products containing processed meat products are to be accompanied at introduction into the Union by the relevant certificate for meat products laid down in Union legislation. Composite products containing processed milk products, which are to be subjected to veterinary checks, are to be accompanied at introduction into the Union by the relevant certificate laid down in Union legislation. In addition, composite products containing only processed fishery or egg products which are to be subjected to veterinary checks are to be accompanied at introduction into the Union by the relevant certificate laid down in Union legislation or a commercial document where there is no certificate so required. The composite products subjected to veterinary checks pursuant to Decision 2007/275/EC are, by their very nature, the ones that may present also a higher public health risk. The levels of potential public health risk vary depending on the product of animal origin which is included in the composite product, the percentage in which that product of animal origin is present in the composite product and the treatments applied to it as well as the shelf stability of the composite product. 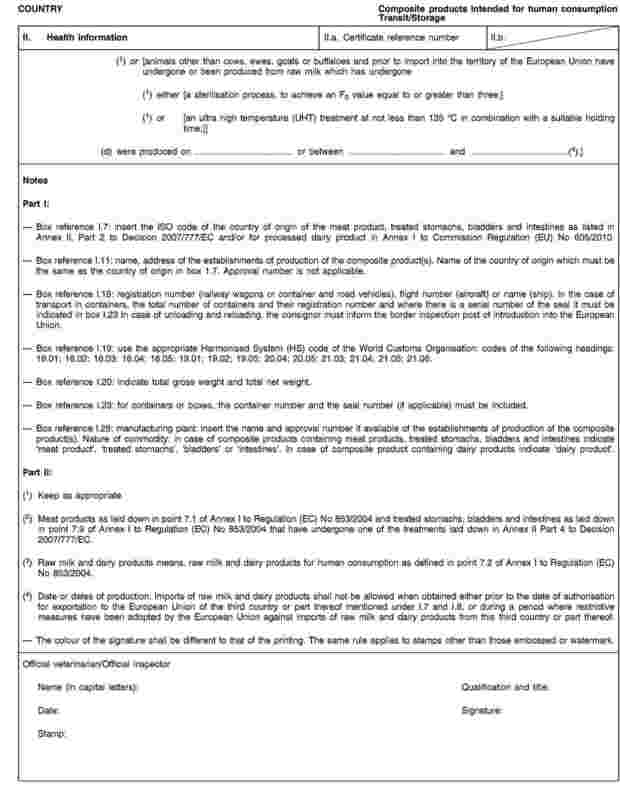 It is therefore appropriate that the public health requirements laid down in Regulation (EC) No 853/2004 apply to those composite products even before the expiry of the derogation provided for in Regulation (EC) No 1162/2009. In particular, the certification of compliance with public health requirements as laid down in Regulation (EC) No 853/2004 should be provided for in this Regulation for the importation of the composite products containing processed meat products, of those composite products containing half or more of their substance of milk products or of processed fishery or egg products and of those composite products containing no processed meat products and less than half of their substance of processed milk products where the final products are not shelf-stable at ambient temperature or where they have not clearly undergone in their manufacture a complete cooking or heat treatment process throughout their substance, so that any raw product is not denatured. As a consequence, the derogation laid down in Regulation (EC) No 1162/2009 should no longer apply for those composite products. The animal health requirements concerning those composite products are already laid down in Union legislation. Pursuant to those requirements, those composite products should in particular only be imported from approved third countries. A specific model health certificate attesting that such composite products imported into the Union comply with those public and animal health requirements should be laid down in this Regulation. As a consequence, the certification requirements laid down in Decision 2007/275/EC should no longer apply for those composite products. 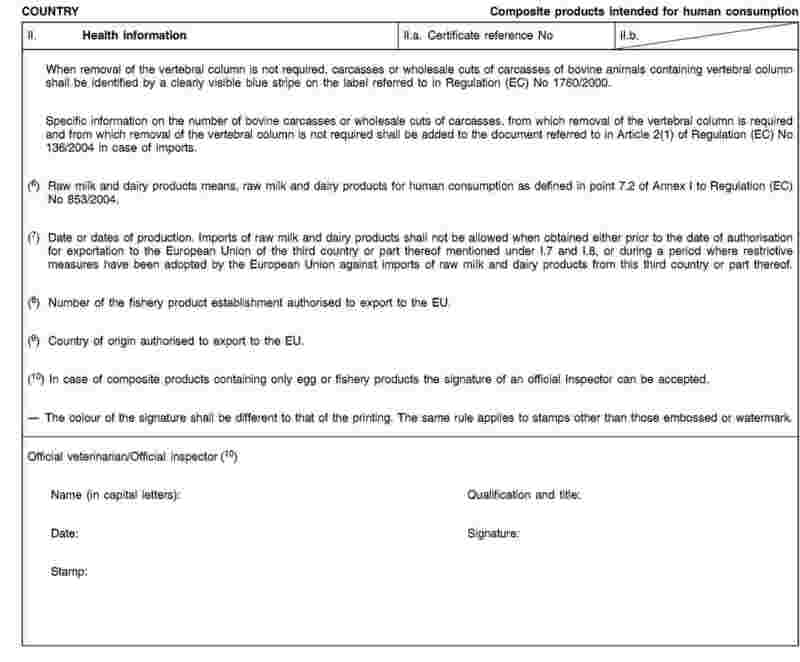 For the other composite products containing half or more of their substance of products of animal origin other than milk products or fishery or egg products, the certification requirements laid down in Decision 2007/275/EC should continue to apply. However, for reasons of simplification and clarity of Union legislation, it is appropriate to include those certification requirements in this Regulation, so that the main rules on the certification of composite products be laid down in only one act. Decision 2007/275/EC and Regulation (EC) No 1162/2009 should therefore be amended accordingly. Due to animal health reasons, a certificate and specific conditions for transit via the Union should be provided for. However these conditions should be applicable only to composite products containing processed meat products or processed dairy products. Specific conditions for transit via the Union of consignments to and from Russia should be provided for, owing to the geographical situation of Kaliningrad, which only concerns Latvia, Lithuania and Poland. To avoid any disruption of trade, the use of certificates issued in accordance with Decision 2007/275/EC prior to the date of application of this Regulation should be authorised for a transitional period. This Regulation lays down rules on the certification of consignments of certain composite products introduced into the Union from third countries. For the purposes of this Regulation, the definitions in Article 2 of Decision 2007/275/EC shall apply. 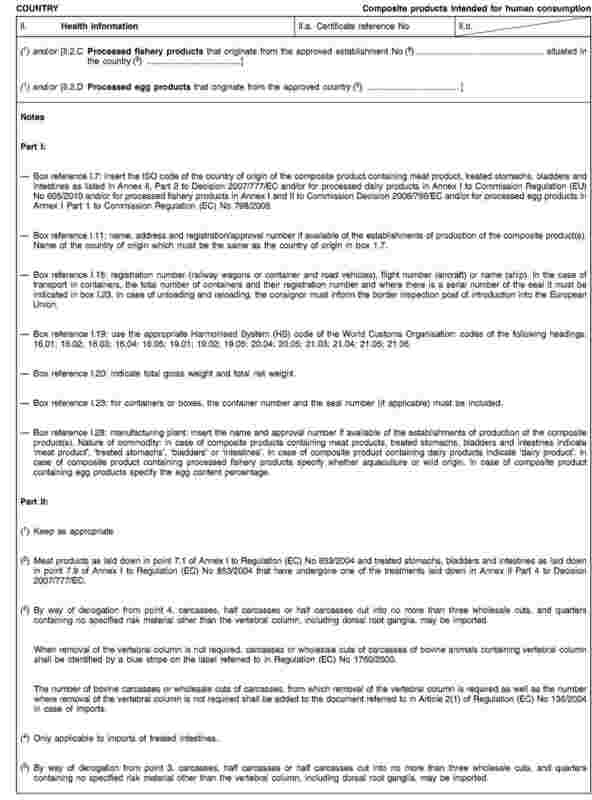 composite products containing half or more of their substance of processed fishery or egg products and covered by Article 4(b) of Decision 2007/275/EC. 2. 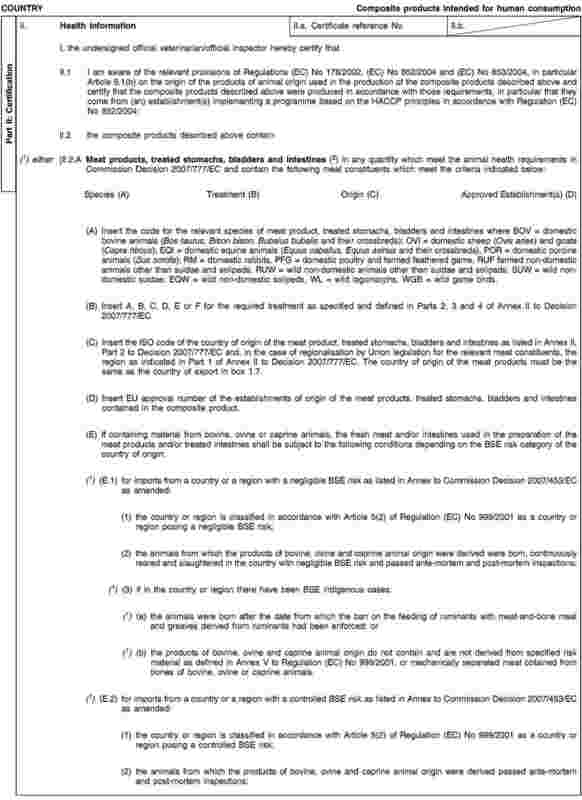 Consignments of composite products referred to in paragraph 1 shall be accompanied by a health certificate in accordance with the model health certificate set out in Annex I and comply with the conditions established in such certificates. 3. 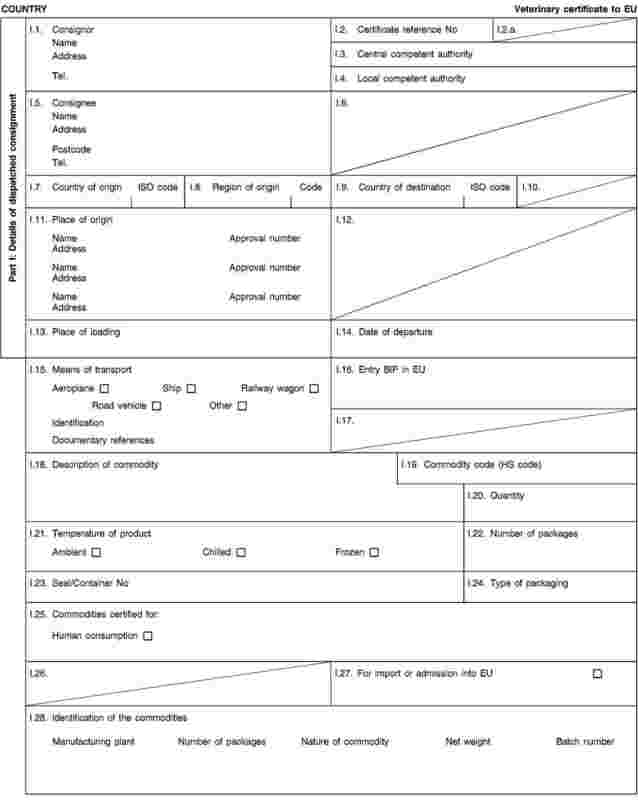 Consignments of composite products containing half or more of their substance of products of animal origin other than those referred to in paragraph 1 shall come from a third country or part thereof authorised for the introduction into the Union of consignments of the products of animal origin contained in those composite products and shall be accompanied at introduction into the Union by the relevant certificate laid down in Union legislation for those products of animal origin or by a commercial document where there is no certificate so required. they are certified as acceptable for transit, including for storage as appropriate, on the common veterinary entry document referred to in Article 2(1) of Commission Regulation (EC) No 136/2004 (11), signed by the official veterinarian of the border inspection post of introduction into the Union. the consignment is certified as acceptable for transit on the common veterinary entry document by the official veterinarian of the border inspection post of introduction into the Union. 3. Regular audits shall be made by the competent authority to ensure that the number of consignments and the quantities of products leaving the Union territory matches the number and quantities entering the Union. Article 5 of Decision 2007/275/EC is deleted. ‘2. By way of derogation from Article 6(4) of Regulation (EC) No 853/2004, food business operators importing food containing both products of plant origin and processed products of animal origin, other than those referred to in Article 3(1) of Regulation (EU) No 28/2012 (13), shall be exempt from the obligation provided for in that Article. For a transitional period until 30 September 2012, consignments of composite products in respect of which the relevant certificates have been issued in accordance with Article 5 of Decision 2007/275/EC before 1 March 2012 may continue to be introduced into the Union. It shall apply from 1 March 2012. Done at Brussels, 11 January 2012. (3) OJ L 139, 30.4.2004, p. 55. (4) OJ L 139, 30.4.2004, p. 206. (5) OJ L 165, 30.4.2004, p. 1. (6) OJ L 338, 22.12.2005, p. 83. (7) OJ L 314, 1.12.2009, p. 10. (8) OJ L 116, 4.5.2007, p. 9. (9) OJ L 312, 30.11.2007, p. 49. (10) OJ L 175, 10.7.2010, p. 1. (11) OJ L 21, 28.1.2004, p. 11. (12) OJ L 296, 12.11.2009, p. 1.